WHEN Fiona MacGregor moved into the house next door to her daughter and two grandchildren, the first thing they did was remove the boundary fence to create one large, cottage-style garden. “The two gardens are now separated only by the veggie patch, with leeks, tomatoes, herbs, beans, peas, beetroot and herbs, and a chook run with our two little red hens,” she says. With a large frog pond, tightly planted natives in the front and cold-climate perennials including foxgloves, aquilegias, hollyhocks andsalvias, Fiona says the garden reminds her of her childhood in Scotland. “I’ve found that cowslips and snowdrops grow really well here and they are very nostalgic for me,” she says. Fiona’s informal garden in Oaks Estate will be open to the public on November 1 to raise money for breast cancer supporters Bosom Buddies. “Bosom Buddies is a charity that I think is very important and, of course, breast cancer affects so many women,” says Fiona. Fiona says that she and her husband are both keen gardeners and work together on the garden, having brought plants with them from their previous established garden in Griffith and propagating from plants in her daughter’s garden. 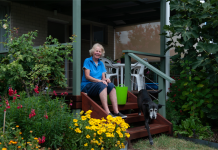 “When we moved in, back in 2008, there was nothing much here except a dilapidated old banksia rose, so I took some long-service leave and made the garden beds over winter, and started from there,” she says. She says that much of the garden now self sows and grows by itself. “I love the garden, and all the seasonal changes that we get throughout the year,” she says. 35 Williams Street, Oaks Estate, open 11am-4pm, on Sunday, November 1. Admission $5. Refreshments available and a small plants stall. All proceeds go to Bosom Buddies. 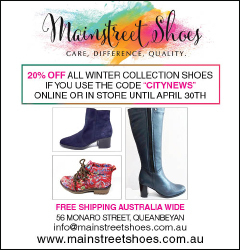 For more information at 0406 376500. 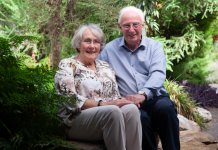 CHRISTINE’S delightful and inspirational Gowrie garden will be open to the public as part of Open Gardens Canberra on the weekend of November 7-8. Christine says the garden was essentially a “barren BMX track” in 2005 when she moved in, but having brought pot plants and rooted cuttings from her previous garden, she was able to create an amazing space on a very low budget. 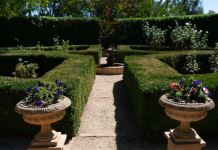 Paths edged by perennials lead to different rooms of the garden where hidden treasures abound, and large mirrors strategically placed on boundary fences make the garden seem endless.